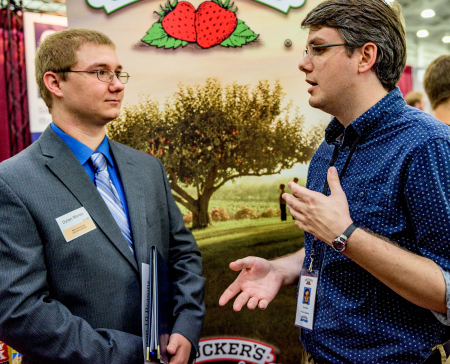 Career Prep Pays Off: Internships, co-ops, and research opportunities give Rose-Hulman students an edge in finding employment and graduate school placement. The Class of 2016 had a 53-percent placement rate through February 1. Providing exceptional internship and career placement opportunities has earned Rose-Hulman citation as one of the nation's best colleges for students seeking a top-notch education with great career preparation that makes for an outstanding return on investment, according to The Princeton Review and its 2016 book Colleges That Pay You Back: The 200 Schools That Give You the Best Bang for Your Tuition Buck. See the 2016 Colleges That Pay You Back list here. The Princeton Review chose the colleges and universities based on return on investment (ROI) ratings it tallied for 650 institutions last year. The ratings considered 40 areas from academics, cost, and financial aid to graduation rates and student debt, to alumni salaries and job satisfaction. The Princeton Review editors also culled data from the company's surveys of administrators and students from the 2014-15 school year, along with PayScale.com's surveys of college alumni, conducted through April 2015. In the book's Rose-Hulman profile, The Princeton Review editors praise the institution for being "one of the top undergraduate engineering schools in the country" and quotes students as describing the institute for having a "job placement rate and average starting salary that are amazing." The Office of Career Services reports the placement rate for Rose-Hulman's 2016 graduating class already at 53 percent as of February 1, after a record number of companies attended the first of two on-campus career fairs for this school year. Nearly 93 percent of this year's seniors have had at least one internship or undergraduate research experience. The career information section of The Princeton Review's Rose-Hulman profile lists an ROI rating score of 93 (out of 100). It also cites PayScale.com figures reporting that Rose-Hulman's graduates with at least a bachelor's degree have a median starting salary of $67,300 and median mid-career salary of $115,700.